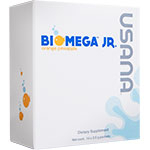 Our Products >> USANA BiOmega Jr. Savvy parents know that omega-3s are important for their children’s development, which is why many give their babies formula that is fortified with omega-3 fatty acids. But when children switch to solid food, it may be more difficult for them to get enough omega-3s, especially if they don’t like fish. In fact, nearly 80 percent of children in North America are estimated to be deficient in omega-3s. Fortunately, it’s easy to give your child a smart start for lifelong good health with USANA’s high-quality omega-3 supplement for kids, BiOmega Jr. This delicious orange-pineapple flavored gel offers a highly absorbable form of omega-3 fatty acids EPA plus DHA in a delicious, creamy gel that that kids love. And because it comes in single-serve packets, it’s easy to give kids on the go. Give kids all the benefits of fish without all the pouts—BiOmega Jr. is a tasty treat that helps kids get the omega-3s they need.